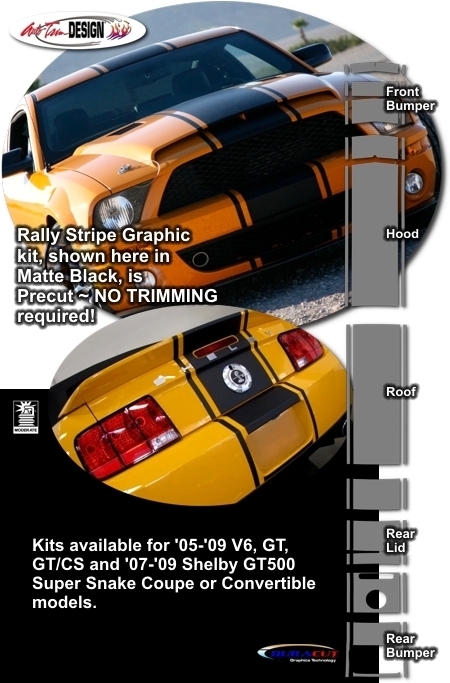 Need a rally stripe graphic package for your '07-'09 Shelby GT500 Super Snake? Or, simply need a Super Snake stylized kit for your '05-'14 V6, GT, GT/CS or GT500 model of Mustang? Trick it out with our Bumper, Hood, Roof, Rear Deck Lid & Rear Bumper Graphics kit. Graphic pieces are PRECUT and ready to install - Minor trimming required. This stripe package is not just a box of straight strips. Our kit consists of prefitted and contoured pieces as shown in the illustration. For '07-'14 Ford Mustang Shelby GT500 and GT500 Super Snake models, removal and re-application of factory applied Rear Lid "SHELBY" lettering may be necessary for kit installation. Trimmable one (1) piece Hood Scoop Kit (ATD-FRDMSTNGGRPH416) consist of one (1) 18" x 34" (45.72cm x 86.36cm) piece that can be hand trimmed for most hood scoop applications. Spoiler pieces are included with Shelby GT500 and GT500SS kits only. All other kits require selection of proper Rear Spoiler as an option at time of order. Trimmable one (1) piece Spoiler Kit (ATD-FRDMSTNGGRPH231) consists of one (1) 16" (40.64cm) long precut piece (outer strips included) that can be hand trimmed for most after-market spoiler applications.